Not to be confused with the Mercenary Digimon, Agumon (Classic). Agumon (2006 anime) is a Dinosaur Digimon whose name and design are derived from the onomatopoeia for biting. As a Starter Digimon, Agumon has great potential for being a huge asset to anyone's team. A unique Agumon which has bound red leather belts around its arms, it is questioned whether its growth differs from previous digivolutions. As it's still growing, its power is weak, but it has grown hard, sharp claws on both its hands and feet, and it exhibits its power in combat. 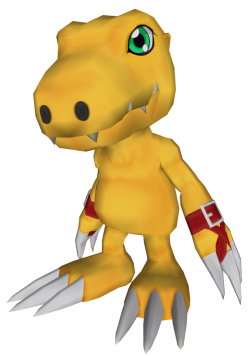 Agumon is a Reptile type Digimon with a Flame attribute in its Rookie stage. This Digimon has two attack skills - the Baby Flame, which continuously shoots small flame balls; and the Baby Burner, which shoots a charged flame ball from its mouth. Shoots flame from Agumon's mouth. Along with Gaomon, Lalamon and Falcomon, Agumon is one of the four Digimon the Tamers can choose from, when starting the game. This page was last modified on 6 March 2019, at 04:57.